In any crisis there exists a point in its development beyond which crisis managers are no longer in control of circumstances. 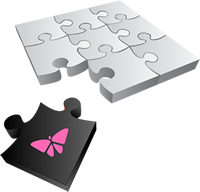 Proactive tools that might have made a difference just yesterday, or even an hour ago, are no longer effective. The crisis communicators and managers are now reduced to merely reacting as best they can to a cascade of events. Crisis becomes catastrophe and the opportunity to turn back the tide is lost. This is the tipping point. The current state of affairs, post internet, is quite different as illustrated in figure 2. You’ll recognize in figure 1 the sigmoid diffusion curve derived from Everett M. Rogers’ seminal work on the diffusion of innovation. 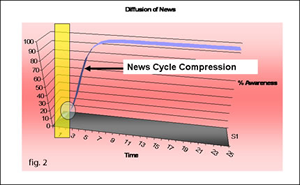 This curve was a fitting visual representation of the process of news diffusion in the pre-internet age. Visibility and interest in the event begin to rise slowly from the time of the event itself (time t=0). This was the Warning Phase. At time t=7 the curve began to accelerate. 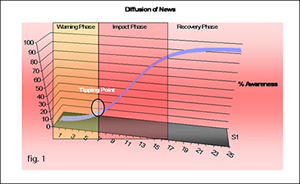 In this acute phase there was little that could be done to stop the spread of the news, but there was time to attempt to influence perception as the news was received and to devise appropriate recovery strategies for implementation beginning at time t=17. The warning phase has contracted to such a degree that we must now anticipate crises from minute-to-minute monitoring of internal and external sources of information (Wharton professor of legal studies and business ethics Thomas Donaldson advises companies to create dedicated teams of crisis communicators for just such a purpose). Is this a non-routine event? 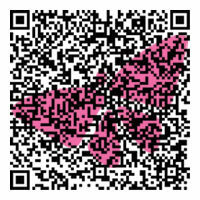 Does it risk undesired visibility? Would that undesired visibility in turn threaten reputational damage? If we answer yes to any one of those questions it is time to begin steps to gather information, assess the threat, extrapolate to the worst case, prioritize the risks of all potential consequences, devise a plan of action, and finally, to execute the plan. Warren Buffet said, “It takes 20 years to build a reputation and five minutes to ruin it.” Warren Buffet is almost right. It takes 20 minutes for the newswires to accumulate and disseminate the information, so that’s what we have… a critical 20 minutes. Upon first detection of impending crisis the crisis communicator should be empowered to respond in all media. Contingency planning should already be in place for such an immediate response. Silence is today equated with stonewalling and all its associated negative implications. An unimaginative “no comment” response is out of the question. Another Buffet, Jimmy Buffet, said, “When life gives you limes, make margaritas. Jimmy had it right, too. You have to lead with the positive – you can always find something. The counter-diffusion of positive and negative information has been described quantitatively, in part, by Vijay Mahajan, et al. 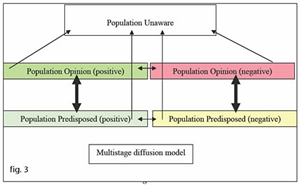 in their multistage diffusion model (figure 3). Simply put, in qualitative terms the model, as adapted to our purposes, demonstrates that there is a constant flux of public opinion dependent upon the flow of both positive and negative information. In the absence of positive information reaching the undecided early on in the crisis, more negative opinions are formed and persist for a longer period of time. For the communications team a torrent of positive, truthful information disseminated in all appropriate media is the weapon of choice in response to a crisis.